The Wakasa Bay is one of the most scenic stretches of coastin Japan. 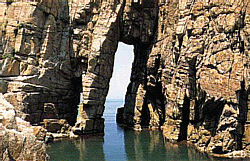 The peaceful bay is surrounded by inlets and cliffs on one side and a stretch of mountains on the other. There are manybeautiful sites along the Wakasa Bay. but more importantly, there are rnany National treasures, designated by the Government,tucked away within the mountains of this secluded area. fire and war, they even protected their temples before their own　houses! 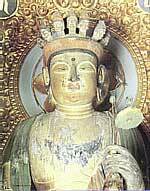 established the Wakasa area as part of the Fukui　prefecture. curious temples, serene coastline and wealth of history are sure　to inspire and enchant. 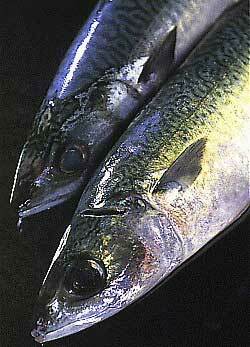 Mackerel Road. 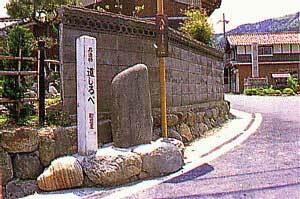 This route was heavily traveled by　merchants　bringing fish and salt from the ocean ports of Wakasa to Nara and　later to Kyoto. Today, you can take the JR Kosei Line frorn Kyoto that spans　the length of Lake Biwa. At Omi lrnazu change to the JR bus　headed for Obama. Another approach is via Tsuruga in Fukui　prefecture or Maizuru in Kyoto prefecture. The train that runs　between these two cities is called the &quatObama line&quat. Traveling to major attractions can be done by train or bus, but　a car can be convenient for exploring the ocean side peninsular　and mountain regions. 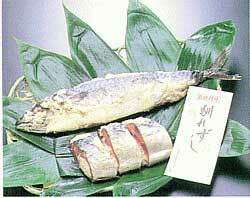 The name Wakasa has two different meanings, according to local stories. Thefirst meaning　cornes from a Korean word. 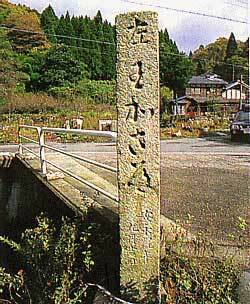 Since the Koreans often used this area as a port for their travels to Japan or China, they often referred to it as the "crossroads" or Wakasa in Korean. This is one derivation of the name. The second story has another theory. ln ancient times the ruler of Wakasa, Kashi Wade no Omi, went to an lmperial party in Nara. All of the rulers were drinking sake together on a　riverboat. Suddenly, cherry blossom petals fell into Kashi Wade no Omi's sake cup. The Emperor was quite astonished that this had happened because it was fall, not spring. The Emperor told Kashi Wade no Omi that because of this occurrence he must change his narne. 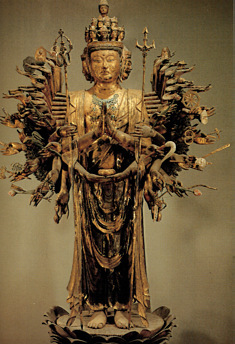 Wakasakura, the Emperor said, symbolized &quatWake&quat or youth because the　blossorns fell very early in the year and "sakura", of course, for the cherry blossoms. One, of the charms of Wakasa Bay is that despite the fact that it is a large area, the JR trains and buses make it easy to reach most of the interesting sites. ln addition, rental bicycles are available in front of Obama and East Obama stations. A short bus tour of the temples that surround Obama is also available, with two departures daily from March to November from Obama station. These tours, however are only offered in Japanese. Bus lines that are convenient from Obama station are the Natasho line, the Omi lmazu line, the Nishizu line and he Fukutetsu bus-Mikata line. There are dozens of ryokan,minsyuku and hotels from which to choose.Prices very,depending on the type of accommodation, but regardless of where one says, one will discover the warm hospitality of Wakasa. Many outstanding traditional Japanese inns can be found through out the area. Here guests can enjoy the best of Wakasa's regional cuisine, skillfully prepared, while also relaxing in an atmosphere of elegance. Located next door is an inexpensive Kokurnin Shukusha (People's Lodge). 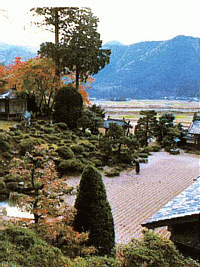 For a list of ryokan, minshuku and hotels please contact the Tourist lnformation Center Obama, (0770) 53-1111. The Wakasa bay is home to many long traditions that have been passd down from generation to generation. One of the oldest is the carvincl of agate. 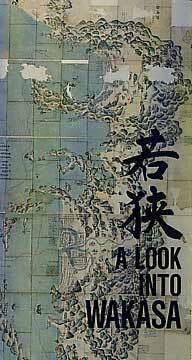 A Korean tribe, called Wani, brought this skill to Wakasa in the 8th century. 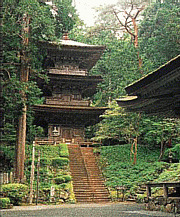 At that time the Wani tribe　worshipped the agate and built the Hiko Hime shrine to honor it. Today. rings, necklaces. and other accessories are made and sold in Obama. 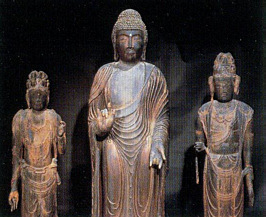 Perhaps the most famous craft in Wakasa is the lacquerware. 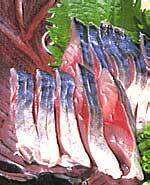 Narezushi A kind of sushi seasoned by fermented mackerel instead of vinegar. 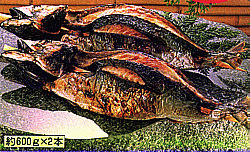 This sushi is probably a result of the Mackerel Road trade. 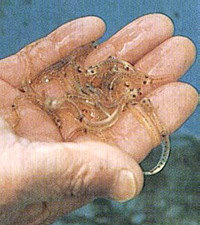 WakasaKareI This is a very thin flat fish. 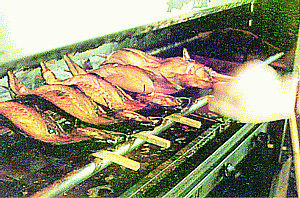 The fish are hung outsidetb dry for many days. Blow Fish Very popular, yet expensive. 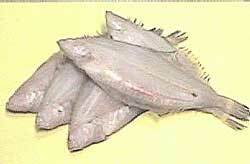 Takahama is knowvn for its blow fish. ous area in Wakasa, makes a very interesthg kind of soba or buck wheat noodles. The soba is called Jinenjo Soba or soba made from sweet potatoes. 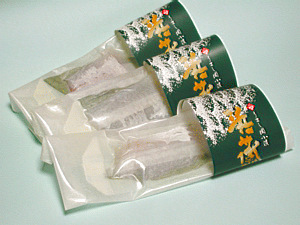 This type of soba is typical of this region. The people of Natasho are very proud of this soba. Kuzurnanju A starch cake made with bean jam filling. You can see it being made in the summer. Decchiyokan A sweet,soft jelly made of azuki beans. root grown in the moun tains around Kumag awa. Wakasa lacquerware is distinct frorn others because it is colordipped any where from eight to one hundred times. The different methods used for grinding the chopsticks determine the pattern and design. Mother of Pearl and small pieces of egg shell are often used in the designs. 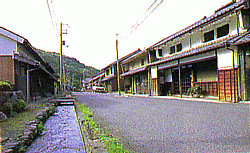 Houses and shops line the streets in the Nishizu area of Obama. where the lacquerware is carefully produced one phase at a tirne. Obama is world's largest producer of Iacquer chopsticks. These chopsticks are rich in color andhave a wide variety of designs. 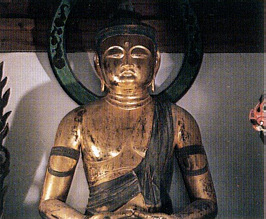 Sueno pottery, which can be found in the Kaminaka area today.had been produced in Wakasa since the 8th century. lt is recog nized for its earth toned colors and rustic appearance. 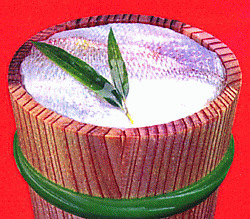 Washi or Japanese paper is another product with many uses. Today. Wakasa washi is used for making umbrella's, Japanese paper dolls. and paper for sliding doors. Wakasa washi is known for its strength and durability. The deep color and interesting designs on Wakasa's roof tiles make them very popular for indoor ornamental decoration. Their high quality clay keeps from breaking in the cold winter snow so they are highly prized. waterfalls there. 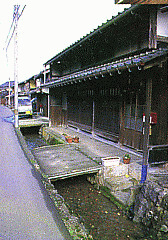 Visit the Wakasa History Museum and make paper at Wakasa Washi no le which is across the street. Plan a fishing trip and spend the day on a small deserted island. 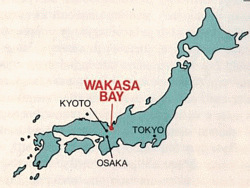 Below is a map and diagram showing the major attractions of the Wakasa Bay. lf you are interested in tryng your hand at these　traditional crafts please visit the shops. Seiwa Make your owm chop sticks. The store itsetf sells ovef 300 dlflerent types. A 5 minute walk from East Obama staition on the way to Jinguji and Mantokujj. Opell every day frorn 9:00-5:0. (0770) 56 -0884. Tsukamoto Mingei Center. Make you own lacquer dar urna The fee is \500. From mama station take the JR bus headed to Nishizu. Get off at the. Fukutani bus stop. Open everyday frorn 8:00-7: 00. 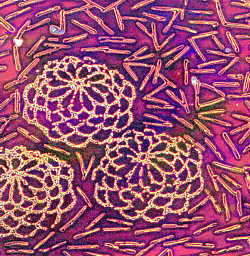 (0770) 52-2590.